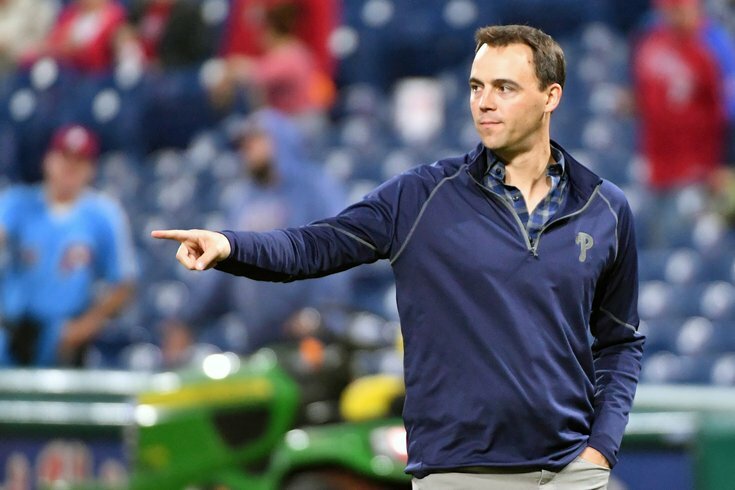 Phillies GM Matt Klentak still has work to do this offseason. At the height of a historic collapse, Matt Klentak hopped a flight to Denver to address the crisis on his Phillies. The GM then announced that every member of the organization would return next season – every coach and every number-cruncher, including the boss, rookie manager Gabe Kapler. Klentak really knows how to defuse a catastrophe, doesn’t he? But then what did you expect? For the three puzzling years of his tenure running the Phillies, the novice executive has mastered only one skill, and that’s finding a way to wriggle out of blame for his own resume of failure. Matt Klentak is incompetent. Of course, if you have been reading this column since the advent of PhillyVoice, you already know that. I have squawked like a trained parrot about all of his mistakes – the illogical player transactions, the squandered millions, the incessant drumbeat of tone-deaf comments. The young double-talker has survived three years of bungling because he has hidden, effectively, behind the new wave of analytics. There was always an implication that he knew more than the more conventional thinkers because he had mastered the calculus of baseball. After he botched the very first pick in the draft two years ago by selecting Mickey Moniak, his plea for more time found many supporters. When he moved the best prospect in the organization, Rhys Hoskins, to the outfield last spring to make room for first baseman, Carlos Santana, stats were offered as his best defense. His decision to sign free-agent pitcher Jake Arrieta late in the winter had a distinct purpose—to add veteran leadership that would prove invaluable on a young roster. Thirty million dollars later, the moody pitcher has become one of the biggest busts of the season, on a team still in dire need of a steady hand. And now, even after Klentak’s team did the unimaginable, flopping from 15 over .500 on August 7 to a sixth-straight losing season – a first in baseball history – the GM’s insulting response is to bring back everyone responsible for the implosion. There is a message in all of this, a clear signal that only now is beginning to sink into the consciousness of his many media enablers. Klentak has no connection to the city where he has worked for three fruitless seasons. He has never bothered to look up at the half-empty stands and wonder what the customers were thinking. The fans have been trying to tell him something all season, but he missed the message. They never believed in this team, or in the way he was building it – featuring games filled with 3-2 counts, damaging defensive shifts and an endless array of meaningless pitching changes. Now we can add to all of that tedium a monumental flop when the games mattered the most. In the hands of someone who knew how to do his job, who understood the city where he worked, there would be major changes. The definition of insanity is to keep doing the same thing and expecting a different result, isn’t it? Obviously, the only response from the organization that will be welcome now is from the one executive left who matters, owner John Middleton. If he snapped, “I want my bleeping trophy back!” after the 2009 Phillies lost the World Series, what is he thinking now? Middleton was just a kid when the Phillies had a historic collapse in 1964, blowing a 6 1/2–game lead with 12 left. If he takes the trouble to research what happened after that epic choke, the owner will see that the team didn’t get that close again for 12 years. Is Middleton willing to wait that long this time? How much more patient can he be with a general manager who has no record of success and who just oversaw a debacle reminiscent of 1964? Hey, John. The fans want that bleeping trophy back, too. Do something. •	When the Phillies ran onto the field for their streak-breaking win on Saturday night, Odubel Herrera and Dylan Cozens lined up in the wrong positions – Herrera in left and Cozens in right. The last time this happened in baseball is . . . . never. Does it make you wonder how well the Phillies are being managed? It should. •	Former Phillie Jayson Werth was pulled over last week and – you won’t believe this – acted like a jerk. First, he handed the police officer a MLB player identification card and said, “We do a lot of work with you guys.” After the cop told him to get out of the car, Werth angrily refused to submit to a DUI test. He was booked. Hey, all of you fans who attended the 2008 tribute weekend in August at Citizens Bank Park, are you having second thoughts yet about that standing ovation you gave to this obnoxious dolt? •	Chip Kelly has had a really bad run as a coach since his Eagles ran aground in 2015. Kelly lost his last two games here, went 2-14 in his only season with the 49ers and is 0-4 right now at UCLA. That makes him 2-20 since his two 10-win seasons with the Eagles. The father of one of his current Bruin players said Kelly’s success at Oregon was a fluke. No argument here. •	Everybody needs to calm down, at least a little bit, about the encouraging first game of the preseason by Sixers guard Markelle Fultz, the No. 1 draft pick who struggled with shoulder issues and the yips in his rookie season. Yes, he did connect on a 17-foot jump shot. Bravo. Now I need him to hit 10 of those in one game. After all, he is the top pick in the 2017 draft. That’s not asking too much. Right? •	Philadelphia has a new hero. Gritty, unveiled last week as the first Flyers mascot in two generations, made a spectacular, instant connection with a city that already has the best mascot in sports history, the Phillie Phanatic. How did this hairy, goofy furball also become a national sensation? After a week of careful study, I can reveal his (her?) secret: It’s the eyes. Definitely the eyes.